I'm not really sure if I have already shared this earlier or not. I have got a couple of fruit plants planted in pots in my small gardening space on the rooftop. These include a two mango plants, one pomegranate and the grapevine. Also, the pineapple crown I placed in the soil last year is growing well, though, I am not really sure when I could have the fruit in this, if at all I am going to get a pineapple out of this. The grape vine has had some grapes a couple of times, ever since I have planted it, and the pomegranate plant, which is around 2 years old too has had one small fruit last year, of the dozens of flowers. 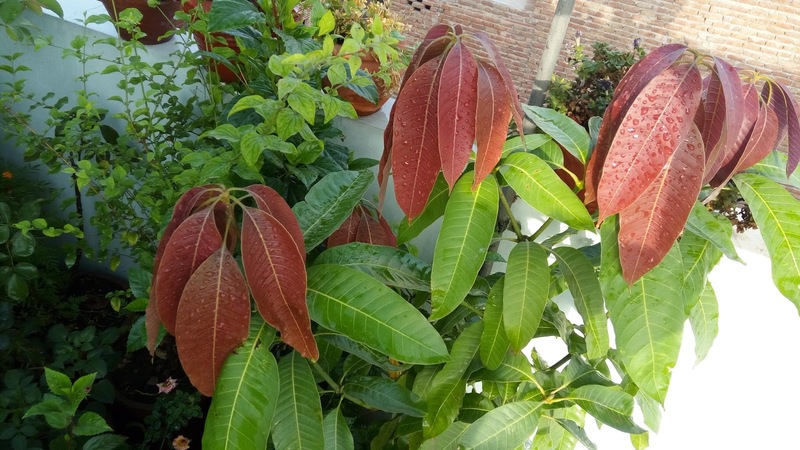 I have had mango plants earlier as well, one of which died after a similar transplantation I carried on it to get it a better container that could support it's growth. That too was around 2 years old before it died. Taking that into consideration, this was a risky operation as I had to be careful enough that I am not doing any harms to the plant during or after this transplantation, and also, I had to ensure that the plant could stay safe even after the transplantation. Moreover, I had to make sure that the new container I am transferring this plant in was big enough to support the plant for two more years, since the 12 inch earthen pot couldn't suffice anymore. The mango plant, some months back, sending out fresh new leaves every now and then. This time of the year is something that can be considered a good enough time to do things like this, as there is not too much heat nor is it too cold, so, I believe the post transplantation phase (around 10 to 15 days) would go smoother, which will give the mango plant a good enough time to settle down in the new environment. To move the plant, I had to take it out of the old earthen pot and place it in the bigger plastic container I had prepared for this. 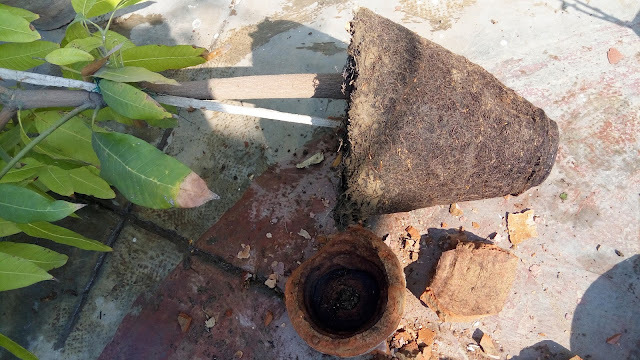 The only way I could see which could have led to the least amount of damage was to break off the earthen pot to take out the plant as it is, with as minimal a damage to the roots as possible. 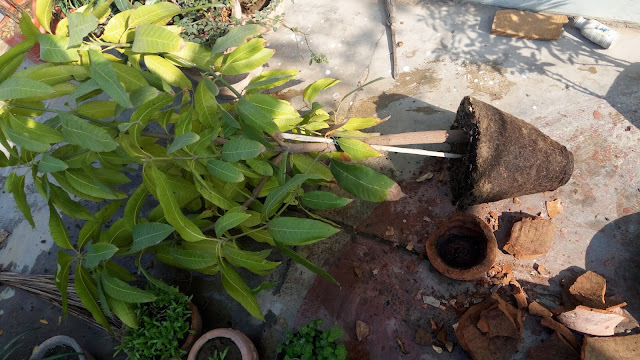 The mango plant, after getting it out of the earthen pot. I broke down the pot, it was quite strong for a four year old earthen pot. As expected, all it contained were the roots of the mango plant, that had taken the shape of the pot, as intricately that the structure that came out even had all the contours of the earthen vessel, with some of the roots going out of the big water drainage hole at the bottom, which I had to remove as that too had taken the shape of the pot and it was next to impossible to save these roots. 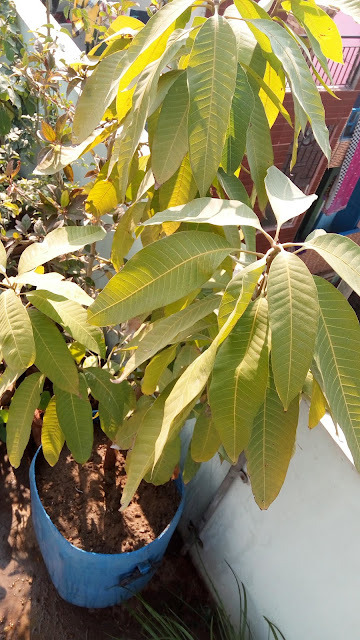 The mango plant, after getting it out of the earthen pot. You can clearly see the container sort-of the roots have created. Once the plant came out, I filled the plastic vessel with soil, created space in between to place the entire plant in between and then placed the plant in there, and the filled the rest of empty space with more soil, and once everything was done, used a piece of wood to try and make the soil as compact as possible, and then watered the plant abundantly. The mango plant, after getting replanted in the new bigger plastic container, which would be its home for the next two years or so. I will be keeping a close look at the newly transplanted plant to see if there is anything wrong with it, Other than that, I will also keep my fingers crossed to hope that this time it's not something like the last time around, and also that hopefully, after two more years, I will again have to re-transplant this in an even bigger vessel, that time, it'd be harder for me, as this would become a bigger plant and will have even more weight that now. Maybe, some years from now, I would successfully do a blogpost showing off the mangoes I got from this plant. Who knows?